Notes: Extremely Rare These two drachms (see CNR XXVII, June 2002, lot 30) are apparently issues of the Illyrian King Ballaios. Save for his coinage, there are no other references in the historical record of this king. Nevertheless, based on the numismatic evidence, Ballaios was a monarch who reigned in the vicinity of Pharos and, later, Rizon, from circa 190-175/168 BC. Prior to the discovery of these two coins, no drachms have been attributed to Ballaios. 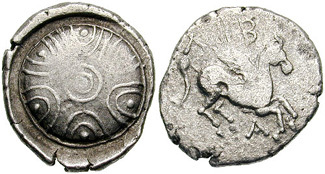 A drachm of the same artistic style, but with pegasos flying left, though, has been published, but it was attributed as an "uncertain Illyrian coin." See von Schlosser, Beschreibung der Altgreichischen MÜnzen I: Thessalien, Illyrien, Dalmatien und die Inseln des Adriatischen Meeres, Epeiros, pg. 70, no. 1.